The scene: three neighborhood boys (including my son of seven years) gathered round a large and jagged row of icicles. The triple dog dare goes out to knock them down. My son steps up to take the challenge! At this moment he’s up in Salt Lake at the children’s hospital getting examined for an eye injury. He got eight stitches at the local hospital. We’re all praying there is nothing more serious. Yes, he got piked in the eye with an enormous icicle. In other news: I tried to play and record a game of 40K today, but that didn’t work out. I actually thought I would get some 40K stuff up on youtube. Sorry. But I must say in that first turn I saw the great potential of the Iyanden army. Ah, Eldar, my old love. My first army ever. Heather got married today. I took my daughter up to her wedding. It was beautiful. Update: just heard back from my wife up at the hospital– all is well. Just minor damage, nothing huge. 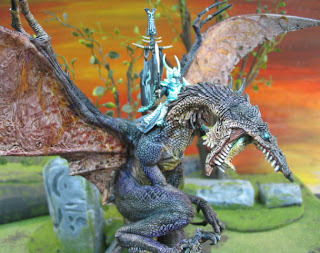 Picture: a Dark Elf Lord on Dragon. See pics of the whole army here. I’ve had some comments like “well, that’s no legal in a tournamen”. Who says I want to be in a tournament? If I want to get whipped for nine hours straight and pay for the privilege, I’ll head to Vegas. Ayup, that’s the great advantage to having just a small, informal gaming group. Not a lot of stress and I can use whatever models I please. If you want one of these made for your army, the cost is in the $150-250 range, everything included, a completely custom job on deluxe base. We need a pretty broad range for execution, though. Email me at bluetablepainting@gmail.com for a quote. My Dark Elf army is complete at a cool 2500 pts, with a few heroes to spare. Well, I suppose I would like to add another unit of infantry. I was thinking a throwaway unit or two of spearmen, but then I contemplated what wicked badasses the Black Guard are and I’m thinking a second unit of those would fit the bill. That would bring the army up to a cool 2800 pts. Blarg. What am I thinking? This army is plenty fun the way it is without getting megalomaniacal. This morning I found seven inches or so of snow on the front walk and I spent the morning shoveling that. It’s not so much a chore. It’s fun to be outside and getting something productive done. It was a slow day at the studio. The day after Christmas. I emailed everyone saying no one was expected in. But a few of us showed to play some Warhammer Fantasy. I played against Janene’s Dwarfs and that was a lot of fun. Notrep of that forthcoming. I had a huge pile-up of work from over the holidays, but I hit my groove and got everything done that could be done. I was there until 11pm. When I got home the kids were all in bed. Well, except the youngest who was into this room and that, with us chasing him around like a pair of lethargic cops. My favorite line from Ron Paul’s “The Revolution”. Still needs some work, some polishing. I don’t want the base components to be too identifiable. Oh, I’m a filthy little backslider. Isn’t that how it goes when thinking about an army? So, I slipped away for a few hours today (yes, Christmas Day; no, I wasn’t missed, the kids were all playing with their new toys) and headed down to a vacant assembly room to mutter and putter. 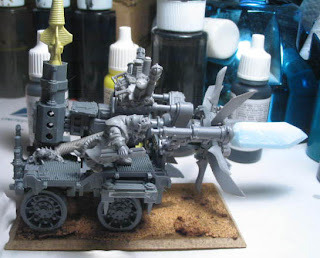 I made a Skaven Warp Lightning Cannon from scratch and it turned out so well that I think the rest is going to work out. You see, my evil plan is to see if I can finagle this army mostly from bitz. 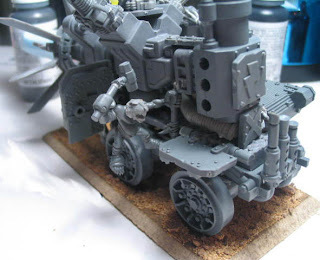 An unholy combination of ork40k-tech and plastic plague monks. It’s going to be cheap to make and with a lot of conversions. 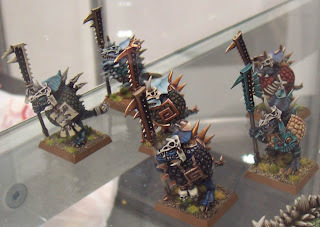 I already have the sixty “skavenslaves” painted up in the form of night goblins. I did those for D&D. I plan on adding a few taskmasters on the back for flair. 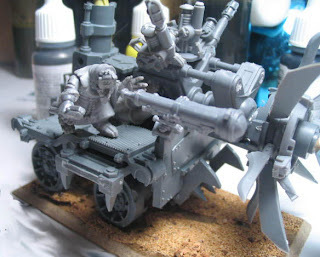 Here are other models to be converted: Jezzails, Ratling Guns, Warplock Engineers (actually made one of these satisfactorily). 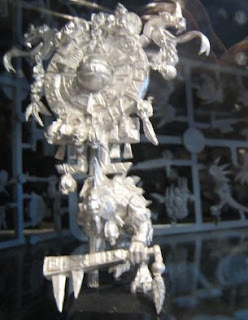 So, the only models to be bought are: Globadiers, and the Plague Monks (lots of them, about a hundred by my count). Here’s the army list I’m thinking of. I am absolutely open to advice. 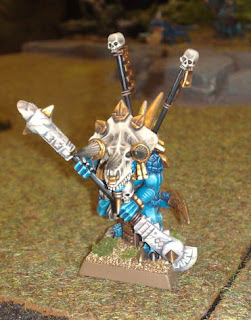 Please tell me how this army could be more fun, variable, and interesting. You might try nixing the Chieftain for a Warlord – twice the point cost – but think about your opponent’s face when they find out your slaves have leadership 10 – priceless. Also, the Chieftain isn’t likely to do much, even with the bands of power – you could put your Warlord in the back to help protect him or up front w/ GW for some heavy hitting power – or add the Chieftain as a BSB for the extra re-roll on break tests – again keeping him in the rear rank. Also, 18 Jezzails are a lot – likely to get ate up by flyers and such, and with their BS, really only (very) useful for mounted stuff and monsters – consider taking only 12 – better yet, 8. For the Warlock Engineers – Storm Daemon and dispel scroll is a must – also consider the warpscroll – very useful. 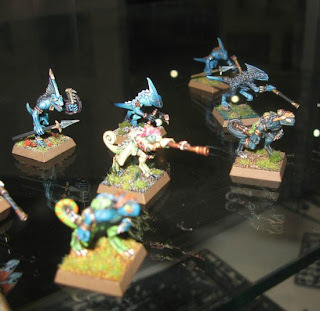 Remember a lot of Armies now have pretty good magic phases (Demons, VC, Lizardmen, High Elves, Dark Elves) – so, having the extra warp lightning spell can help (2-lvl 2 and 1-lvl 1). I’m a fan of Gutter Runners – particularly tunnelling teams – I know they’re expensive, and pretty random – but, I love seeing them come up in front of 2 or 3 warmachines on a hill, or in range of a lone wizard. Plus, they’re scouts. Oh, and musicians for Slaves – it only takes losing combat instead of drawing once to make a believer out of you. This purpose of this notice is to remind the forgetful of the annual visitation by the minion of Chaos known to the unworthy as Santa Claus. As the diligent will recall, the incursion occurs regularly every 8742 to 8766 terran hours, roughly corresponding to a terran year. This trespass has occurred with disturbing regularity since at least the Horus Heresy, and perhaps longer, as many records were misplaced. The faithful will recognize the target on sight, as his garb and gear mark him immediately as an agent of the abominations. Santa Claus is a corpulent, bloated creature approximating the human form. It wears a crimson tunic the color of fresh blood, marking him as a possible follower of Khorne. It is bearded, mocking the honorable squats, and its hair is a sallow shade of gray, betraying its unnatural age. Be advised that despite the creatures fearsome name, no claws have been observed, and the former is likely a ruse. The target has been observed in the company of smaller creatures having the appearance of thin (less than 30 kg, approx. ), stunted (1.5 meters) humanoids with pointed ears. 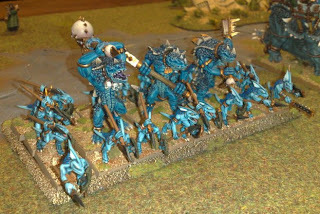 Their appearance suggests the involvement of the decadent Eldar, and although that race denies involvement (*reference the Rudolphian Campaign [index 111-BGE-MMXCII- Primus], specifically the Battle of Yukon Coneliaus IV [ibid., index 6]*), agents are advised to be prepared for their involvement, as the Eldar are known for their deceitful ways. Santa Claus is conveyed by means of a grav-sled powered by unnatural livestock as detailed below. The target’s vehicle is a grav-sled. It has superfluous runners which are used only on landing and take-off. Despite the appearance, no frozen water is necessary for its operation (another ruse). 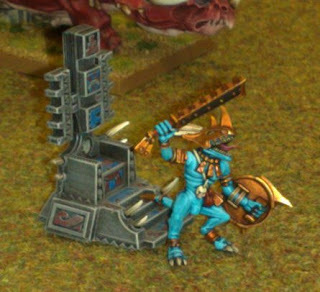 The vehicle’s resemblance to the foul Palanquin of Nurgle should not be discounted, even though the colors continue to be reminiscent of Khorne. The device is powered by the unholy ministrations of eight or nine quadrupeds. Ordo Malleus scholars have identified these creatures as warped versions of an extinct species of terran mammal known as a Moose (reference 900002-ER-CIV). 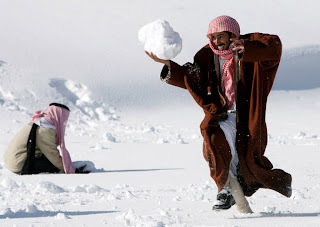 These beings single-mindedly pull the target’s vehicle during its yearly invasion. They are outfitted with belled harnesses which are apparently imbued with the ability of flight. These beasts have been likened to the Fiends of Slaanesh, and such a comparison should not be dismissed too lightly, as the creatures shed a luminous substance as effluent as they move. Inquisitors should take care to avoid exposure. Perhaps more disturbing is the variable number of the minion- creatures. On occasion, a ninth Moose has been observed, placed before the other Mooses. This creature radiates a sickly reddish glow from its snout, as a psychic beacon to other followers of the Vile Ones. This Chaotic device has allowed the target to navigate despite our best efforts to jam its navigation systems. Santa Claus gains entry to the domiciles of loyal Imperial Citizens (see below) and leaves small Chaos Rewards to tempt the faithful. Inquisitors are reminded to confiscate and incinerate these items before any lasting damage is done. As a localized temporal distortion field is in effect around the target, these items are secreted in the habitations of the Imperium at exactly 2400 hours in every location defiled by the creature. It is therefore possible to gain entry to the citizens’ cretches and remove the items (often cunningly hidden in footwear) before the citizens are aware of the heresy that has been committed upon them. In other cases, removal of the items after the citizens have discovered them is possible. 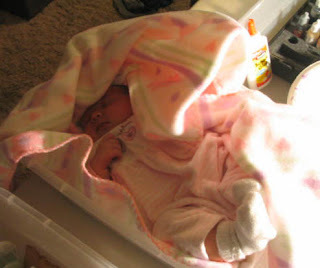 In such situations, small children are occasionally loath to surrender the items, as the tainting of the juveniles has already begun. Executions of the above are to be handled in the most expedient manner possible. Santa Claus enters the domiciles be way of heating ducts and waste vents. The size of the opening is not a factor, as the creature can adjust its mass and displacement by means of psychic manipulation. Mining these openings with frag, krak and other demolitions has proven unsuccessful. The creature egresses by the same means, after ritually caressing his nostrils. No mucus has ever been recovered. Although all previous attempts at the destruction of Santa Claus have failed, Inquisitors are urged to make such an attempt whenever possible. However, of more importance is the suppression of cultist activity associated with the yearly incursion. The Tainted have been known to erect shrines in their homes in the form of shrubbery adorned with baubles and lights [Note: the shrubbery is often highly inflammable, and offers a discrete method of executing the offending heretics without calling undue attention to the operation]. Other warning signs include: hallucinations involving sugared candies during slumber; excessive singing; references to ‘A magical time of year’ (note the influence of Tzeentch); the construction of effigies made of snow; and the performance of Slaanishi rituals while underneath plant clippings of the genus phoradendron flavescens. Once again, executions should be handled in an expedient manner. PS- I just got a kind compliment about how imaginitive I am to have written this. I didn’t write this. I hope everyone has a great time over the Holidays. Along with everyone at BTP I extend a heartfelt thank you and well wishes. Baby Willow (our “Adepticon” baby) is doing well. She is a healthy shade of pink (rather than orange, yellow, purple and red). PS- my Christmas wish is that clients with projects completed will pay for those, and that new projects will get set up. That will really take my stress level down a few notches. So, you can still email me and even call (on Christmas Eve before 6pm). We will be back to normal operation as of this Friday. 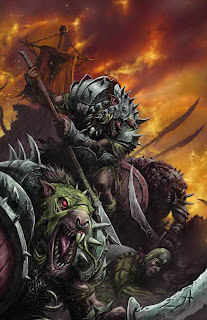 Check out this Combat Calculator for Warhammer Fantasy. 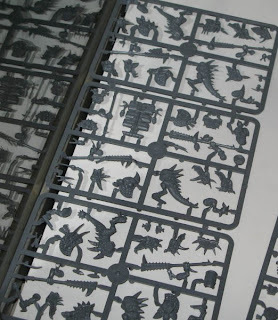 Here’s some new eye candy for Lizardmen, due out in February 2009. I picked these up from Warseer. You can read all the rumors, army list glimpses here. Picture: a Tomb Kings Ushabti. This is a classic look that I don’t think will ever go out of style. GW made three or four different sculpts and they are each very evocative. See the rest of them here. Monday was super-busy as usual. I have a double-load from what accumulated over Sunday. However, Sarah and I got cracking and really made some serious inroads, including getting all the packages out. There were a few loose ends to tie up, so those were going out (BFG PM is ready now). There was a huge snowstorm this morning. I think it dumped like eight inches. It was quite a load to shovel out of. But a few brave artists made it in. We had a magic moment all gathered in the break room eating KFC. 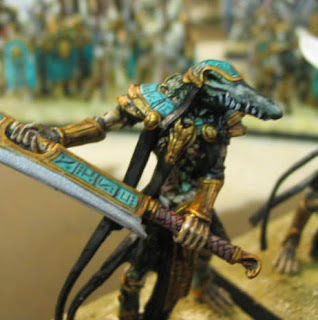 The big news is that I’m going to shelve the Skaven concept army (80% chance) for the time being and get back to my Chaos Space Marines- Dragons of Moloch. I’m going to leave them up over the Christmas weekend (until December 29) with a standing group price of $650. That’s a 2000 point army. If they don’t sell, I’m going to expand them with more variety as I had originally planned. Also, as some of you may recall, we did a 4000 point Iyanden army (Eldar) to go on tour through the Grand Tournament Circuit during 2008. Half of that, 2000 points, as well as the display and scratch-build Eldar attack craft (use-able in game as a Vampire Raider!) are coming back in about a week and that will probably go on the block. I am willing to split this up. In fact, it is likely that I will make each unit an individual item. 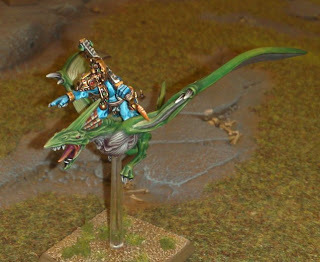 This is ON TOP OF the Iyanden army I currently have at the studio. I would also like to assure potential buyers that there will be NO post-holiday sales. If anything I may pull some items from the block. I will probably add some items, though. Important note: if you buy something from the website, I will get the payment, but the notification is sent to my old email. If you just ping me at bluetablepainting@gmail.com that you made a purchase I will double-check and be sure everything runs smooth. I am very responsive. I really can’t lose. I will miss the Dragons, but if they sell, it will fund the next shot. 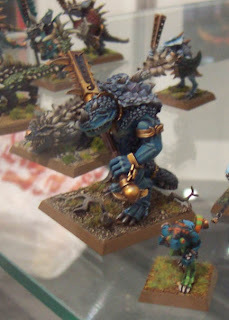 I will probably do Lizardmen. Those are definitely a top three. 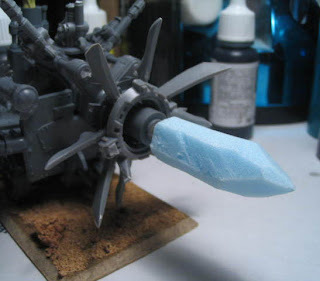 For those of you wondering why the chill on 40K. It’s not on purpose. We’re still doing a lot of 40K and it’s still the top game.